Between next Tuesday, 16 April, It's the day 25 de Mayo, a rich program permeates the show Ferris Wheel, de Carmela Gross, who opened the Lighthouse Santander in late March. The Wheel Giant Project extends the capability to show a series of coordinated actions. Two meetings with experts will put on the table the relationship between art, psychoanalysis and cinema, adding to the educational activities that have been going since the opening of the exhibition. On the last weekend of May, the artist and the curator will participate in a lively chat, marking the launch of the exhibition catalog. But not only that. Visitors have at their disposal a veritable universe of unique information, facílimas to access a touch on the mobile screen - and that extend almost to infinity the experience of the visit, real or virtual, the exhibition space. It is an immersive and pioneer proposal in Brazil, where knowledge and technology come together for a simple visit to the exhibition becomes a great adventure guided by art. 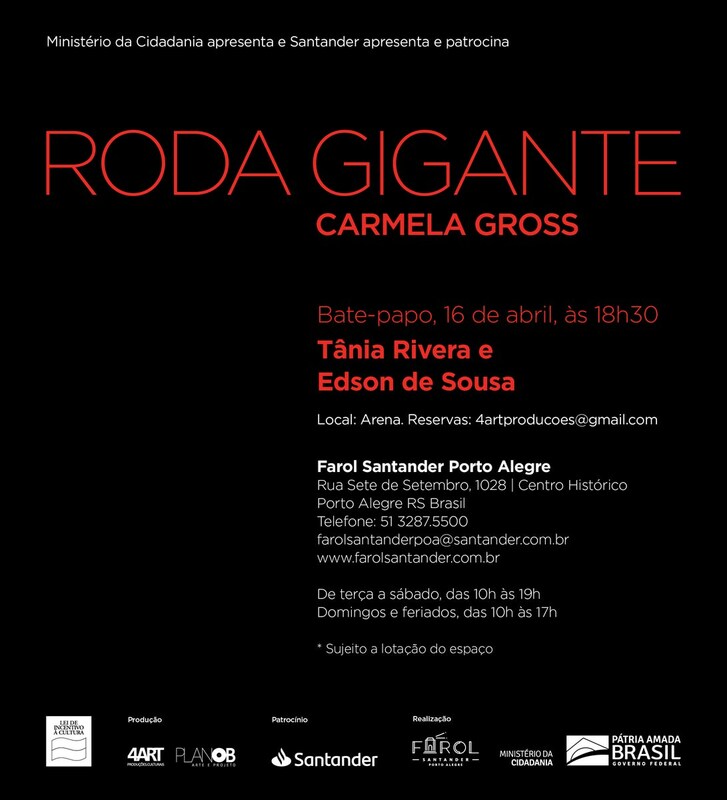 On 16 April, Psychoanalysis visit to Art: Tania Rivera, psychoanalyst, essayist and professor in the Art Department of the Universidade Federal Fluminense (UFF), and Edson psychologist Sousa, professor at the Federal University of Rio Grande do Sul, command a conversation that investigates the possible relationship between the artist's career and the psychoanalytic universe. On 7 de Mayo, the talk is about Cinema and Art: multimedia artist Lucia Koch and architect and curator Priscyla Gomes develop this theme from the list of Carmela Gross's work with the city and with the cinema, to stimulate discussions plural. On 25 March, Exposure closing Eve, Carmela Gross and Paulo Miyada talk to the audience and talk about their experiences, side of creation and the side of the curatorial, that led to the realization of Ferris Wheel, and also on the trajectory of Carmela, represented in the exhibition by works of different periods. That day will be released the catalog Ferris Wheel, in paper and electronic version. This last, moreover, will be available for free download and has several interesting features, or use as voice-over to describe texts, images and other elements. Carmela Gross – Ferris Wheel – Lighthouse Santander. Photo: Vicente de Mello. The dialogue with teachers and students is one of the most valued aspects of the educational program, it puts contemporary art in perspective from a multidisciplinary perspective. 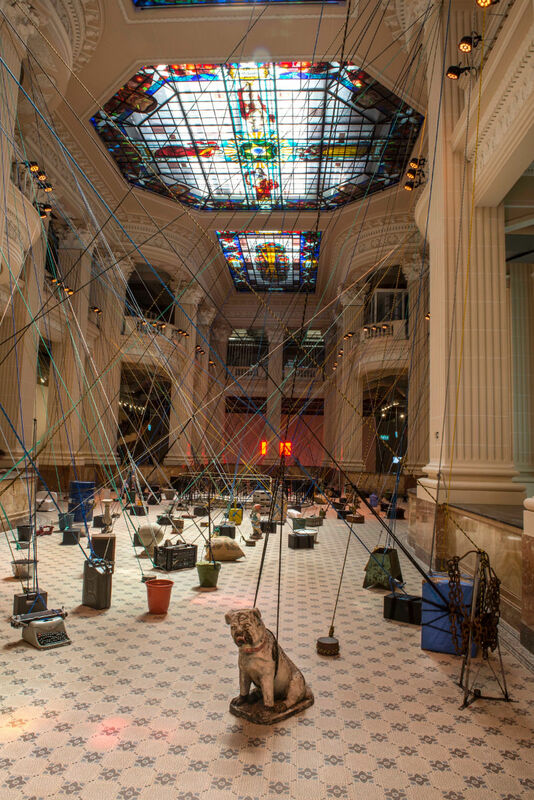 All meetings involving critics and art theorists, guest artists and art educators in a dialogue that goes through technical, content and Brazilian art itself. Besides the content of Ferris Wheel, Carmela Gross and contemporary art, an entire distance learning will be made available on the project website (www.4art.com/capa), in order to allow remote access and further information, videos, conferences and images on display. All this care takes into account the appreciation of the teacher. After all, in the classroom, he is the most powerful student curiosity provocative. And awakening that curiosity can be the door for them to achieve endless possibilities. The lecture series is intended to discuss the work of the artist and Brazilian contemporary art. In this program teachers receive information about the exhibition, the artist and, of course, on contemporary art. A detailed content of distance learning, associated with the series of lectures and meetings, will be available on the project website, allowing remote access and in-depth information, videos, conferences and images on display. Carmela Gross – Ferris Wheel – Lighthouse Santander, invitation. Disclosure. Ferris Wheel leads the way by offering a package of technologies that allow the viewer to have a deeper experience with the works on display. Starting with the application - which, once installed and connected, starts to fill up the visit with a number of stimuli: specific information about each work as the visitor approaches, phrases spoken by the artist herself on certain jobs, data on the data sheet and small interventions that stimulate the questioning of works and artistic production represented there. The exhibition site is another important source of information: It has been fed weekly with texts, interviews, research and new content… Anyway, It offers a real dive in the history of contemporary art. With this, the visit is still going on outside the walls of the space and cultural repertoires are magnified wherever the visitor is. The technologies basket also provides audio description for four works of different media, audio guide and also individual videos POUNDS, guaranteeing the hearing impaired the same level of information to other visitors receive. The visually impaired, on the other hand, They have available texts with larger type and captions in Braille on all exposed works. These actions not only democratize knowledge to enable the fullest level of access, without restriction of any kind. The whole range of offerings increases the visitor to the condition explorer and researcher, as their curiosity and interest increase. It is the art lived the last consequences. The exhibition Ferris Wheel, multimedia artist Carmela Gross, is poster from 26 March and ends on 26 de Mayo. It is composed of an unpublished work, that gives name to the shows, and an overview of the artist's career, with works selected by curator Paulo Miyada. Ferris Wheel, occupying the main hall of the building Lighthouse Santander, is an installation that deals with the real, the transitional and virtual, to the extent that human beings have to adapt to different situations in daily life. concrete objects, physicists, many of them unused or relegated to other functions, They are fixed on the floor, but anchored to the heights of the immense building ceilings by ropes and bonds of all kinds, color and texture. Facing the majestic architecture, objects resist, with their stories, connected to higher levels that evoke the virtual world, but also reaffirm the material essence that dwells. No two ropes entrecruzar, divine power up spaces, feedlots, restrictions or freedom of movement. sparse, but connected to the intent, books, buckets, sand, gears, remains of tools, boxes, Garden sculptures and other objects may portray stories of survival, social rearrangement, nomadic habitats that the precariousness of daily life invents, the hands of the need.